Area : Municipal limits 64.75 sq. km. Pink City 9.8 sq. km. Temperature : Max. 45°C and Min. 25°C in Summer. Max. 22°C and Min. 8°C in Winter. Built in 1727 A.D. by Maharaja Sawai Singh II. 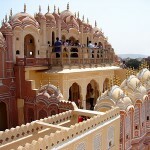 The ‘pink city’ is the capital of desert state Rajasthan, the pink colour associated with hospitality in Rajput culture. The city still beats in its fairly-tale palaces, rugged fortresses perched on barren hills and broad avenues that dot the entire city. It was planned city of its time and encircled by a wall. Beautifully laid out gardens and parks, attractive monuments and marvelous heritage hotels, once the residence of Maharajas, are worth admiration. 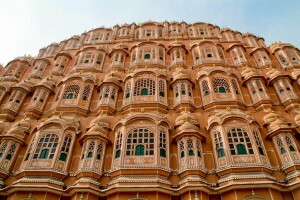 Jaipur is a harmonious blend of culture, education and religion. Air: There are flight connections to the major cities of India. Nearest airport is Sanganer at Jaipur (15 km). Rail: An excellent connection of rail is available to connect with important cities of India. Nearest railhead is Jaipur. Road: A convenient mode of travel to Jaipur is by road, through a network of comfortable buses and taxies. Local Transport: Unmetered auto-rickshaws, buses, cycle-rickshaws. The Rajasthan State Roadways operates regular bus service to Amer Palace and around the city. Hawa Mahal: Build in 1799 A.D. by Maharaja Sawai Pratap Singh, displays beautiful architecture and is a remarkable landmark of Jaipur. The five stroried Hawa Mahal or palace of wind is in pink splendour with semioctagonal and delicately honey combed sandstone windows. City Palace: This former royal residence is an imposing blend of traditional Rajasthani and Mughals architecture. There are a museum and art gallery exist in palace complex. Jal Mahal: As its name denotes this is a palace build amidst a lake and intended as the summer resort for the royal family. The palace is noted for its intricate architecture. A paved causeway leads to it. Amer Palace and Shila Mata Temple: A beautiful complex of palaces, halls, pavilions, gardens and temples built over a period of about two centuries. The palace complex emerges dramatically from the placid waters of the Maotha Lake and is approachable only through a steep path. Dilaram Bagh at its north end provides a spectacular view of the palaces above. 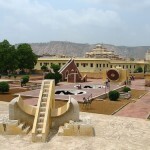 Jantar Mantar: The largest of Jai Singh’s five remarkable observatories. Its complex instruments, whose settings and shapes are scientifically designed, represent the high points of medieval Indian astronomy. Sargasuli/ Isar Lat : The highest tower was built by Sawai Ishwari Singh in 1749 A.D. to commemorate a grand victory. 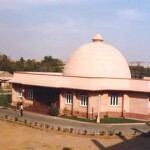 BM Birla Planetarium: The Planetarium offers unique audio-visual education and entertainment with its modern computerized projection system. Open from 12 a.m. to 7 p.m. Closed on last Wednesday of every month. Old City: Once a settlement of nobles, craftsmen and common folks, the city of Amer is now in ruins. There are many temples located here. Govind Devji Temple: The most popular spire less temple of Jaipur dedicated to Lord Krishna. It is located in the central pavilion of the Jai Niwas Garden to the north of Chandra Mahal. The image of the patron deity, Govind Decji, originally installed in a temple of Vrindavan, was reinstalled here by Sawai Jai Singh II as his family deity. Statue Circle: The full-length exquisitely carved statue of Sawai Jai Singh in white marble. Jain Temple: The exquisite Jain temple has some of the most beautiful 19th century paintings in Jaipur style on its walls. 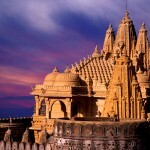 Moti Doongri and Lakshmi Narayan Temple: Moti Doongri is a privately owned hilltop fort built like a scottish castle. The Ganesh Temple at the foot of the hill and the marvelous Lakshmi Narayan Temple built in marble a few years back are also noteworthy. Dolls Museum: Pretty dolls from various countries are on display in the compound of the school for deaf and dumb children, near the Police Memorial. Open from 12 a.m. to 7 p.m.
Philatelic Museum: A fine collection of old stamps is located in the General Post Office building on M.I. Road. For collectors there are stamps here on sale. Ram Niwas Bagh: Built in 1868 A.D. This lush spacious garden with a zoo, an aviary, a greenhouse, a herbarlum, a museum and popular sports ground. Ghat Ki Guni: Beautifully landscaped gardens, laid out in the 18th and 19th century. Sisodia Rani gardens has tiered multilevel with fountains, water channel and painted pavilions and suites of living rooms. Vidyadhar-ka-Bagh is the best preserved one with shady trees, flowing water etc. Jaigarh: The ancient splendour in palaces, gardens, reservoirs, a granary, an armoury, several temples, a tall tower and a giant cannon, largest in the country are preserved here. Nahargarh Fort: Nahargarh fort is situated beyond the hills of Jaigarh at a distance of 8 km from Jaipur. A picturesque road winds its way up the hills. Once the fort was a retreat for the royal family. Although much of its in ruins, the Fort commands a panoramic view from the top of the hill. Amber Fort: Situated 11 km from Jaipur. This is the magnificent hill fort of Amber, a fascinating blend of Hindu and Muslim influence is distinctly discernible in its architecture. 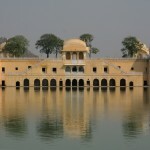 The palace complex is boasts as Sheesh Mahal or Pavilion of Mirrors. 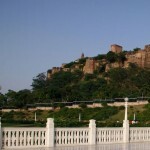 Jaisinghpura Khor: Situated 12 km from Jaipur. One of the settlement of the Meena tribe, it has a formidable fort, a Jain temple and a step-well amid lush surroundings. Galta: Galta is situated 10 km from Jaipur. It is an ancient pilgrimage centre, lying beyond the gardens amidst low hills. Temples, pavilions and holy kunds along with lush landscape make it a delightful spot. It crests the rich over a picturesque gorge and provides an impressive view of the city. The small temple of the sun god on the top of highest peak is visible from all parts of the city. 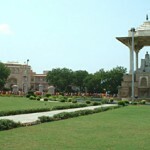 Samod: Samod is situated 50 km of Jaipur. The beautiful Samod palace, has been rebuilt and renovated and provides a fine example of the Rajput haveli architecture and is an ideal spot for outings. Dausa: Situated on the National Highway No. 11, 54 km east of Jaipur, Dausa is an ancient town of archeological importance. It had the privilege of being the fast capital of the erstwhile Kachhawah rulers of Dhundhar. An old fort and many small havelis are located in and around Dausa. This entry was posted in Jaipur, Rajasthan and tagged about jaipur, Amber Fort, Amer Palace, BM Birla Planetarium, City Palace, Dausa, Dolls Museum, Galta, Ghat Ki Guni, Govind Devji Temple, Hawa Mahal, hawa mahal jaipur, Isar Lat, Jaigarh, Jain Temple, jaipur fort, jaipur images, jaipur photo, jaipur pics, jaipur pinkcity, jaipur tour, jaipur tours, Jaisinghpura Khor, Jal Mahal, Jantar Mantar, jantar mantar jaipur, Lakshmi Narayan Temple, Moti Doongri, Nahargarh Fort, Old City, Philatelic Museum, Ram Niwas Bagh, Samod, Sargasuli, Shila Mata Temple, Statue Circle. Bookmark the permalink.